The sun is not even casting shadows yet and the streets are buzzing with taxis hooting for late passengers to hurry up, shopkeepers are sweeping the pavement in front of their shops and children are making their way to school. 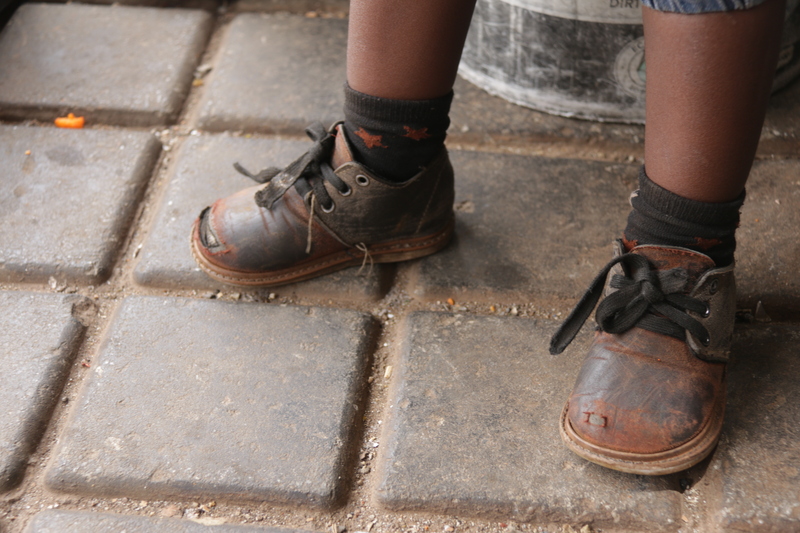 Many people are on their way to their jobs while many others come here, to the Central Business District (CBD) of Johannesburg, to make a living in the informal sector. Job opportunities are scarce so many have resorted to creating their jobs through selling goods and services on the sidewalks – from brooms to fruit, to traditional beaded jewellery, and even a new hairstyle, if you have the time. The streets are a hub for entrepreneurs and opportunists looking to make money. One such hub is the Home Affairs office at the corner of Plein and Harrison streets. It is a fertile gathering place for opportunists as it is one of the busiest places in town, making it good for business. Among the vendors crowding the sidewalk outside the Home Affairs Office, is a beautiful young woman, Dikhabiso, right, (meaning decoration) Moiloa, 21, who is selling packets of chips, dishcloths and costume jewellery. She is with her two-and-a-half-year-old son, Tlotla (happiness). She says that she has been selling goods on this sidewalk only for a short while. Moiloa was 19 and living with her uncle when she unexpectedly fell pregnant. She was still in high school at the time trying to complete her Grade 11. The first time she realised she might be pregnant, she was already three months pregnant and at four months she confirmed the pregnancy at a government clinic. When she went to the clinic for the first time, the nurses gave her a pregnancy test as well as an HIV test. While waiting for the results the nursing sister placed a stethoscope on her stomach to find the first sign of life – a heartbeat, as this is the first organ that develops in a foetus. After confirming that she was pregnant, the sisters then prescribed her medication to encourage her appetite, folic acid, which helps prevent neural tube defects in the baby and iron. After that she went for monthly check-ups. If it was not for government clinics Moiloa says she would not have had access to proper prenatal care. Her boyfriend and family were very displeased with her pregnancy. She tells how her boyfriend and uncle’s wife plotted against the pregnancy by crushing an abortion pill and spiking her tea. “I felt like cramps in my womb. I went to the hospital, I was bleeding. They said I took the wrong pill,” says Moiloa. At the hospital her boyfriend and aunt soon arrived and admitted to spiking her tea with an abortion pill that they had obtained illegally – which could have cost them not only her baby son’s life but hers as well. As she tells her story, a joyous couple, dancing as they come down the stairs of the Home Affairs Office, are followed by a short entourage of about seven people. The couple has just been married. The woman is wearing a large flower in her hair, a white dress up to her knees, with organza down to her ankles, but her black lycra pants are sticking out and shining through the organza. She is followed shortly by a man in a suit. Moiloa continues her story, she is not distracted by the couple. This is not new to her and she sees it on a daily basis outside of Home Affairs. She is not emotional about her story as she does not see it as unique. Nor is it unique to be living in the CBD struggling to make just enough to get by on a day-to-day basis. After the abortion pill incident, Moiloa was weak and feeling unsafe in her own home, so she packed her clothes and left home for good, she says. Having nowhere to go she lived in the streets of the CBD. She has not been in contact with any of her family since. “Because of what my family did, I no longer speak to them. Although I have their numbers.” She says that she did make short contact with her cousin last month on WhatsApp for the first time. During labour, which lasted two days, Moiloa suffered further complications, possibly due to the abortion pill. The nurses said that as a result of the pill she had sustained burn wounds in her throat which caused her to vomit blood during child birth. She lost a lot of blood. Tlotla had also had an allergic reaction to the pill and he was bleeding from every fold in his skin on his hands, neck and torso. She describes how she would dress him but after 30 minutes his clothes would be full of blood stains. “I stayed in street until July this year. 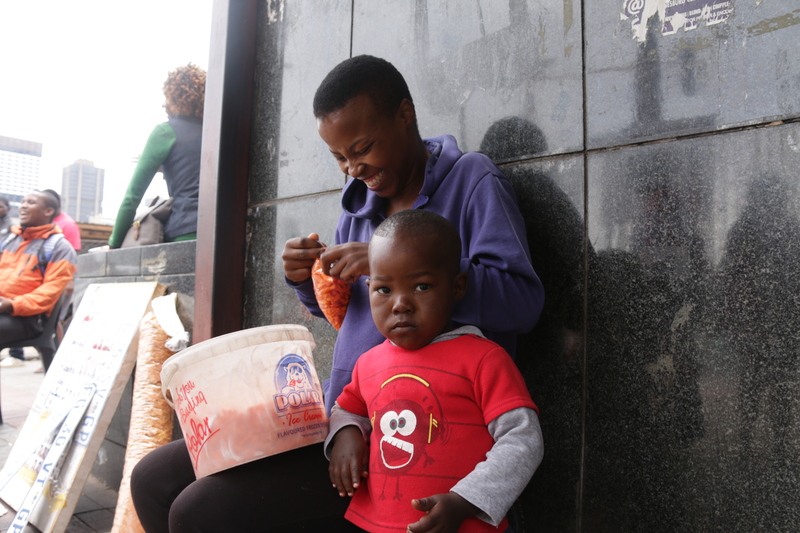 He (Tlotla) grew up in street”, she says pointing at the toddler who is playing in the midst of passersby. She says she had to beg for food and stayed with other homeless people who were mainly men. People donated food and disposable nappies. She speaks dearly of these men who never did anything to hurt her. “They weren’t harmful to me,” she says, and they adored Tlotla. She adds that “I haven’t sold myself. I haven’t take drugs, because I want a future.” The only thing she had to hide from other homeless people were her clothes as they would sometimes steal items to sell for money to buy nyaope (a drug which is smoked or inhaled and consists mainly of heroin and dagga mixed with other ingredients such as anti-retroviral drugs, pool cleaner, milk powder and rat poison). Due to her circumstances, Moiloa says that if it was not for government clinics in the CBD, she would never have been able to afford antenatal or postnatal care. She says she makes R250 on an exceptionally good day. She also turned to traditional medicine, drinking crushed ostrich egg shells which she says was to help shorten the labour process, but due to the abortion pill, she was in labour for two days. She also drank umchamo wemfene (baboon’s urine) for added nutrients. Turning to traditional medicine she says was a cheap alternative to stay healthy during her pregnancy. Gavin Dorasamy, is a middle-aged Indian man who owns a small 5m x 5m herbal shop, Inkunz’ Emnyama, on Joubert Street, around the corner from Moiloa’s sidewalk. He is neatly dressed, wears a small diamond earring in his left ear and is very well spoken. He refers to himself as an inyanga, which is similar to a sangoma (a traditional healer), but who only works with herbal medicine. However, he is not an official inyanga as “I haven’t been initiated yet.” Not that he’s interested in being initated. “For me it’s learning the curative properties” of herbs and plants. He says that he has been working in this specific shop for two years. His family owns four similar shops in Joburg and all the shops’ names start with Inkunz (the bull). His grandfather started the business in 1988. The oldest shop is in the train station and run by an initiated inyanga, who has been practicing traditional medicine since 1970. Dorasamy says he regularly gets expecting mothers in the shop who specifically request ostrich egg shells and umchamo wemfene. He buys the ostrich egg shells from an ostrich farm and resells them for R15 per tablespoon. 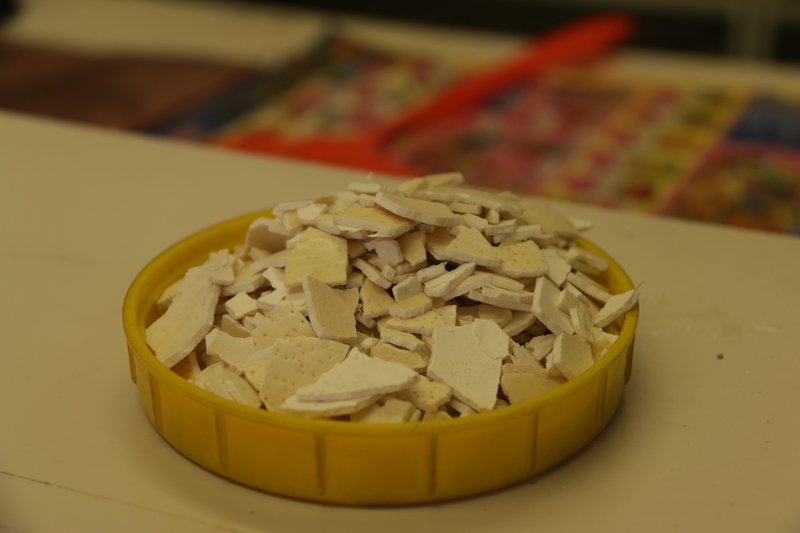 He says the women crush the shells, boil the powder with water and drink mixture as “a source of calcium”. Dorasamy says umchamo wemfene “is basically like dassie urine”. A dassie is the South African word for an African rodent, also known as a hyrax. It is a small, grey, furry animal that lives in rocky and mountainous areas. “What it [the urine] does, it is basically concentrated nutrients from the flowers that the dassies eat,” says Dorasamy. He explains that, “They [dassies] have a den where they will all go and do their business. It [the urine] forms like a resin that mixes with the sand.” He says the urine is not a liquid but has more of a gel-like consistency. The dassie urine and sand mixture is sold in small packets packaged neatly into colourful boxes. He sells the 25gram boxes for R15. He recommends using a tablespoon of umchamo wemfene to two litres of water, boiling the mixture, letting it cool, scooping out the sand and then drinking the liquid. He also recommends it as a supplement for women who have menstrual problems. Dorasamy says there is no single theory for which herbal medicine is used for what. It depends on the inyanga who prescribes the medicine. He also says he may use a plant to treat a condition, while another may use the same plant mixed with something else to treat a completely different ailment. He says his greatest experience practicing herbal medicine comes from using herbal medicine on himself and noticing its healing properties. 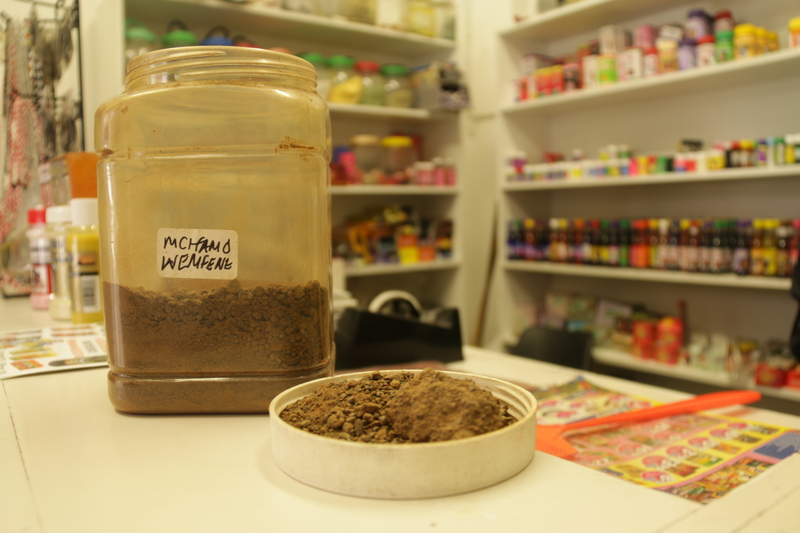 As herbal and traditional medicine is widely practiced in African cultures, herbal medicine is a thriving enterprise in Johannesburg’s CBD. In the CBD there are two free clinics available to pregnant mothers and young mothers. These include Joubert Park Clinic and Jeppe Clinic. Moiloa and Tlotla now at least have their own shack in Freedom Park where they have been living for two months. Although things have improved for her slightly, being a vendor is not something she can do forever. Moiloa says she has regular incidents with the police who are trying to eradicate vendors selling illegally on the streets. She says they have been particularly strict this month and she has had her goods confiscated a few times. After these incidents she has to borrow money to re-buy stock. She returns to illegally selling goods on the pavement as she says she cannot find work anywhere else nor would she be able to afford a crèche for her son if she did. She says she has applied to a few colleges next year as she would like to finish matric. She wants to go back to school so that she can someday fulfil her dream of going into the hospitality industry and providing a good life for her son. While Moiloa’s story is not unique, her story is an indication of a resonating problem in the CBD. A problem of under-resourced clinics unable to provide to the high volume of people and mothers, and a high unemployment rate preventing mothers such as Moiloa from affording a crèche, school and a decent job. 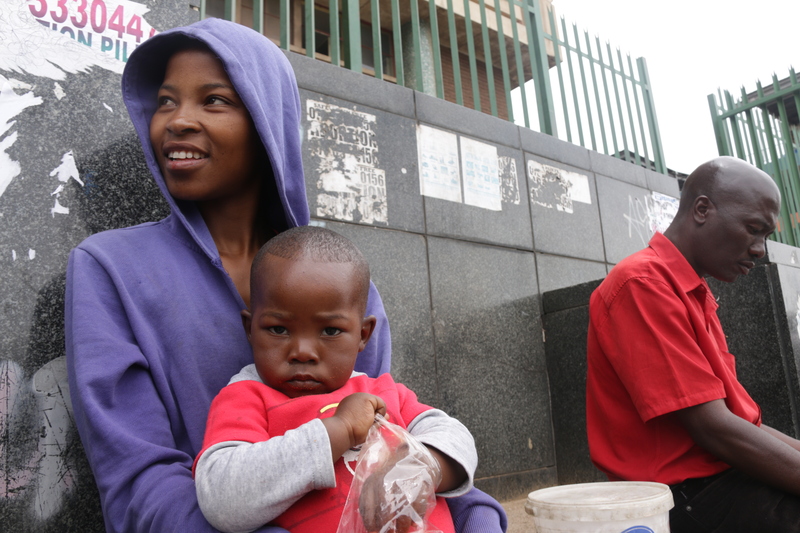 For a young mother in the middle of the city, “Johannesburg is a rough place,” says Moiloa. She says, she has found hope and care in the form of fellow vendors, the homeless and government clinics – to whom she all owes her and Tlotla’s life.